SAIC ExTV is teaming up with the Flaxman Library to present a series of works with both online and offline components. ExTV’s online exhibitions platform will host a show of film, video and new media works by three artists online that relate to objects either made, found, or chosen by the artists for the library cases. This exhibition features the work of SAIC students with multi-media practices, whose work addresses our changing relationship with tactile objects, in our newfound digital world. BFA alum and new media artist Melissa Barron creates “glitch” weaves by hacking a Jacquard Loom. What materializes is code, made tangible. 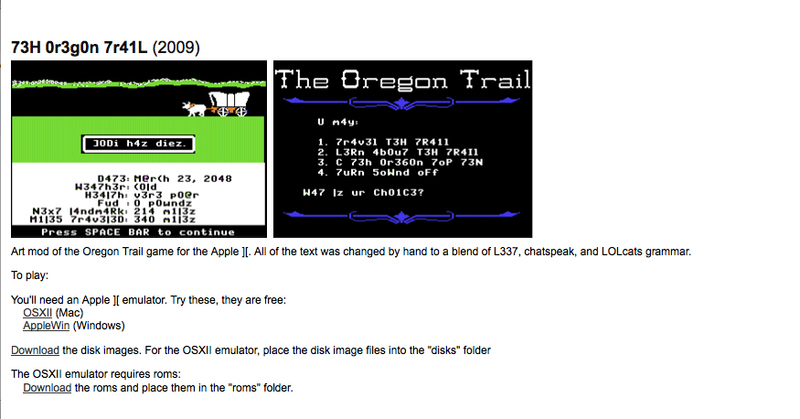 Below, ExTV hosts some of her glitched art mods of vintage games such as Oregon Trail and Odell Lake. Kayla Anderson writes letters to objects around her, inquiring about their relationships and shared experiences. Through video she animates the inanimate, allowing the objects addressed to respond to her attachment. Watch these video letters here. Lyra Hill employs elaborate costumes and sets in her film practice, creating her own fantastical world. We will display her “llama man” costume and the comics Lyra created that inspired her 16mm film For My Psychopomp, which ExTV has made digital. Both exhibitions will run concurrently through Feb 25-March 14. Lyra Hill is a multidisciplinary artist primarily interested in small gauge film and comic books. As part of an extended re-visioning of a recurring childhood nightmare, she started drawing and painting the dream’s antagonist, eventually embodying him by building a costume around her own body, through which to re-encounter her childhood self in a film resembling the original dream narrative. Redressing this relationship between conscious and subconscious personalities lead to the repositioning of the dream monster as a sort of psychopomp, or guide between waking and dreaming states. In this capacity, he appears on the first page of “Night City,” a comic comprised of several dream narratives. Kayla Anderson is pursuing a dual degree in fiber & material studies, video, and visual & critical studies. Her work often stems from personal collections, allowing accumulated material to inspire creative analysis. Dear(in)animate, a narrative in seven parts, explores the relationships formed between humans and inanimate objects; what is often considered a one-sided relationship becomes reciprocal through video and animation.